Pleasant surprises: aren’t they the best? Pleasant surprise has been my sustained reaction to the first solo album in 20 years from Trevor Rabin, the South African composer and multi-instrumentalist who in 1983 thrust temporarily defunct progressive rock pioneers Yes back into the spotlight with the thoroughly unexpected 90125. Surprise, and admiration. Rabin’s influence on my favorite prog band is one I have rarely enjoyed. While parts of 90125 were fun and dynamic, on the three albums that followed it, Rabin’s arena-rock tendencies always felt out of sync with the band’s progressive rock roots and at times actively grated on me. Not that there was ever any question of the man’s talent – he’s a triple-threat on guitar, bass and keyboards, he’s an excellent singer, and based on his track record as a soundtrack composer for the past 17 years, he’s pretty damned good at that, too. Anyone who picks up his new solo disc anticipating Can’t Look Away 2.0 (or its close cousin Big Generator 2.0), will be more than a little disoriented when they give Jacaranda a spin, though. This album, besides being almost entirely instrumental, features the most progressive, jazz-and-classically-influenced playing of Trevor Rabin’s career – a faintly ridiculous statement when you consider he played a leading role for 12 years in one of the progenitors of the prog genre itself. While playing in Yes, though – something he never sought, and which was essentially thrust on him by his bandmates at that time, all members of previous incarnations of the group -- Rabin always seemed to be fighting the band’s musical heritage. By contrast, years later and in complete control of his creative destiny, he sounds perfectly comfortable playing obscure yet impossibly nimble acoustic numbers like the opening “Spider Boogie,” or terrifically complex time-signature shifting jams like “Market Street,” or even dreamy, progressive jazz numbers like “Anerley Road,” which reminds me in places of Pat Metheny. There’s hardly a trace on any of these tracks of the flash and/or wankery that too often characterized Rabin’s playing with Yes. Here, his lines are complex, evocative and unpredictable, and repeatedly value expression and exploration over repetition and volume. This is music meant to be played in a nightclub or a theater, not an arena, and it shows. With “Through The Tunnel,” Rabin rocks out a bit, but still with a loose, exploratory feel. In fact, the track is structured like a prog-rock suite; all heavy guitars for the first two and a half minutes before segueing into the “tunnel” section, gentle electric piano that does a steady build into a completely different extended electric segment, which then falls back before shifting into a fourth section, a 75-second, rather Jeff Beck-esque jam. In the end, it feels a bit stitched-together, but it’s still an exhilarating journey. The Jeff Beck analogy also turns out to be a key one. The fact that Beck’s favorite bassist Tal Wilkenfield guests on “Anerley Road” feels like less than coincidence; the wide range of tones and styles and consistent virtuosity of this album definitely feels like a creative nod to Beck. And that diversity really is pretty remarkable. Take the middle four tracks here just for example: “The Branch Office” is a brief but hard-charging, mostly acoustic-and-keys number with minor bluegrass shadings; “Rescue” is a rearrangement of a piece Rabin first recorded for The Guardian soundtrack, with the distinct airiness and melodrama of a motion-picture score; “Killarney 1 & 2” is a bite-sized solo piano concerto; and “Storks Bill Geranium Waltz” is an odd little nightclub-blues snippet barely a minute long. The range does telescope down just a little in the last third as Rabin moves more into the jazz realm. “Me And My Boy” features Ryan Rabin on drums as Trevor blends heavy electric, acoustic slide guitar and repeating keyboard patterns to hypnotic effect. The terrific “Freethought” feels like straight jazz, even if Rabin rather cheekily throws in brief flashes of arena rock riffage in a couple of places. “Zoo Lake” builds off a slumbering jazz rhythm section and sleepy Cajun acoustic slide, before delivering an expansive electric solo over the top that reminds me a bit of Ronnie Montrose’s great take on the old Western soundtrack number “Town Without Pity.” Finally, closer “Gazania” is an evocative acoustic guitar-and-piano piece with intense picking, another piece that feels like it wouldn’t be out of place on a soundtrack. What this album spotlights again and again is Rabin’s growth as a composer and player. He was always technically gifted, but during his time with Yes, his playing never seemed to have much feel or fluidity; it was all flash and muscle. Here Rabin demonstrates what a complete player he has become. The tracks themselves are disparate in approach, and some bits and pieces fit together stylistically better than others, but overall they paint a portrait of an artist who has come into his own in emphatic fashion. Jacaranda is the best work of Trevor Rabin’s career to date. 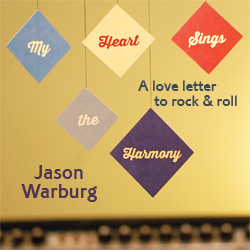 © 2012 Jason Warburg and The Daily Vault. All rights reserved. Review or any portion may not be reproduced without written permission. Cover art is the intellectual property of Varese Vintage Records, and is used for informational purposes only.